I was able to participate in my first Game Jam this year. For those not familiar, it is where a group of people interested in making a game, get together to do so over a weekend. Groups are composed of those interested in Game Design, Programming, Art, etc within the course of a weekend. Before I talk a little about my experience here are some relevant links/information about our game and the Jam in general. I really had a blast and came out of the experience more knowledgable about game design, met some great people, and really liked the final product of the game that was produced. I feel with some additional effort it could become a functional retail product. This years global theme was an audible Heart Beat sound. At this particular location we opted to post ideas on the board. You could post as many ideas as you wanted but were only allowed to get behind/vote for 3 (this prevented someone from saying they were interested in everything). After it was clear that there were about 5 contenders from about 30 ideas we began sorting ourselves into groups based on interests and what we might be able to contribute. I found myself fortunate enough to end up in a group with Unity developers, a game engine I had some experience with, and concept for a game I could really get behind. Once the group was assembled we starting flushing out the mechanic we wanted to focus on, which was gameplay without visuals. We ended up toning back on this and ended up creating something that has a really great aesthetic, in my opinion. The game we worked on Heart of Darkness, pits a player against the unknown, asking them only to rely on their non visual senses and the directions of a robot companion to guide them over, under and threw pits, lasers, stompers and exploding barrels. 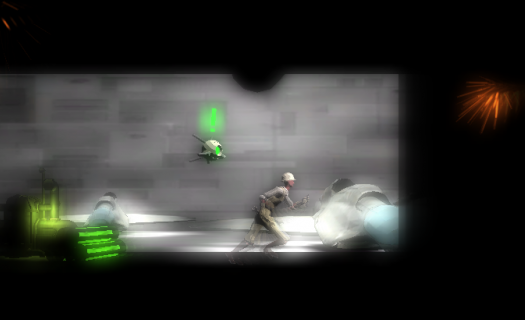 Gameplay footage can be seen here. My contribution was in the areas of game design, sound design and chipping in with the level design. One of the major design contributions I made was to continue to obscure the obstacles in darkness but then bring them into the light once they had been surmounted. This immediately gave the player a sense of accomplishment and context for what they had just survived. In other words they didn’t know they had avoided being squashed, walked onto a moving platform and jumped over a pit, until they had actually done all of that. We also add a little illumination to the dark parts of the game so the players wouldn’t have to effort their eyes too much, so their vision doesn’t get affected, I know this since I had troubles with my vision from some time ago because of this and I had to take a treatment from https://healthyusa.co/the-outback-vision-protocol-review/ to deal with this. On the last day the different groups present their work and everyone was encouraged to play each others games. It is great to see all the different ideas that come from a single theme. Dont be afraid that you do not know enough. For the most part, people are willing to help and there are lots of ways to contribute besides programming and art. Try to work overnight. Its part of the experience. This is something I wasn’t able to do this time around and regret. Try to work on an idea you are excited about. This will fuel you during the process. Keep the scope of your project manageable. There is a lot that goes into a game and you want to make sure you have time to finish, test and add some level of polish to your design. Remember its a team effort so try and have something that everyone can contribute to at all times. Read Taro Omiya’s (one of the Heart of Darkness team members) advice on Gamasutra here. This was my first Game Jam but it wont be my last. It was great being able to create a viable game in such a short time and I got to meet great game designers who I am hope to continue to be friends and work with in the future. I highly recommend the experience to anyone interested in game design or development. If you wan, you can Play Heart of Darkness online now. Arrow keys to move, space to jump.